The semiconductor company’s legal problems could meaningfully damage its business model and financial performance. If you had to summarize what should keep Qualcomm (NASDAQ:QCOM) shareholders up at night, you could do it in a single word: lawsuits. Oftentimes, lawsuits serve as one-time events that can create opportunities for investors willing to weather the near-term pain for the promise of long-term gains. However, Qualcomm's legal headaches are of an altogether different sort, one that threatens to undermine the company's very business model. 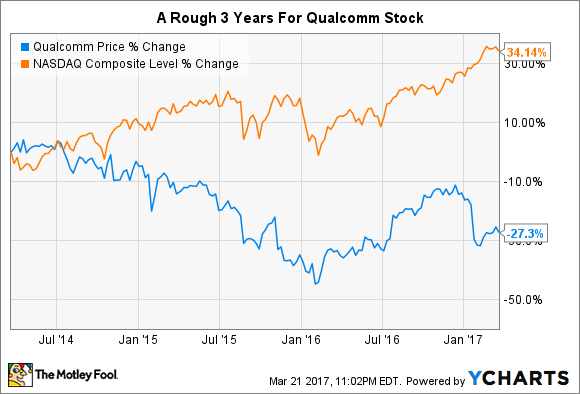 Investors who have followed the company for some time will recognize that legal headaches have been something of a recurring theme for Qualcomm over the past four years. The initial wave largely centered around China and requires a bit of background on Qualcomm's business model to fully understand. Qualcomm operates two main reporting segments: Qualcomm CDMA Technologies (QCT), which records revenue from its semiconductor sales, and Qualcomm Technology Licensing (QTL), which collects royalty payments from Qualcomm's large patent portfolio. Historically, Qualcomm collected license fees for its trove of patents as a percentage of the wholesale cost of every 3G or 4G mobile device produced worldwide. However, starting around 2014, many Chinese original equipment manufacturers (OEMs) simply stopped paying Qualcomm the licensing payments, to protest what some viewed as excessive fees. The Chinese government also opened an investigation into Qualcomm's patent-licensing practices around this time. These events caused Qualcomm to lower its guidance in November 2015 and culminated in Qualcomm agreeing to pay the Chinese government a $975 million one-time fine and making some slight changes to its patent-licensing practices in the world's most populous country. Around the same time, U.S. and European regulators also opened investigations into QTL's licensing business. Some of those investigations have more recently escalated into formal charges. Earlier this year, American antitrust authorities opened a case against Qualcomm that could result in additional costly fines. The South Korean government also fined Qualcomm $853 million last December on similar grounds. Lastly, tech giant Apple sued Qualcomm for $1 billion. Though unlikely to kill the company outright, the cumulative pressure from this legal onslaught could upend Qualcomm's business model, by forcing it to amend or alter the licensing-fee structure it charges OEMs globally, as it already did in China. This alone wouldn't be a death knell to Qualcomm, although it could reduce QTL's impressive profitability. However, the timing could prove disastrous. As you can see, QTL (licensing) generated roughly four-fifths of Qualcomm's pre-tax profits last year. Given its place as the lifeblood of Qualcomm, it's no grand insight that QTL's current legal issues pose significant risks to Qualcomm's financial performance. Unfortunately, the situation grows even more complex. Thanks to QTL's insane profitability, Qualcomm has built up an impressive hoard of $29.7 billion in cash and investments. This war chest could be viewed as a cushion Qualcomm could dedicate to paying legal fees and maintaining dividends even if potential fines grew into the billions of dollars. However, in its most recent 10-K filing, Qualcomm disclosed that it secured $13.6 billion in new debt financing to complete its pending acquisition of NXP Semiconductor (NASDAQ:NXPI), which the company expects will close by the end of the year. The $13.6 billion in secured financing implies the company will need to tap into as much as $24.4 billion of its total cash and investments to reach the estimated $38 billion in total cash required to complete the NXP Semiconductor buyout. In a worst-case scenario, this would leave Qualcomm with only $5.3 billion in cash and investments as well as its current-year cash flows. Last year, cash flows totaled about $6 billion before capital expenditures -- to fund its business, pay for dividends and buybacks, and service its debt. If Qualcomm can successfully defend itself from its current spate of legal entanglements, the company will be fine, and perhaps even be an interesting contrarian investment. However, given the lack of clarity into its legal outlook and the amount of capital it has already committed to buying NXP Semiconductor, the effect that legal fees could have on Qualcomm should have investors worried. As the Romans said, caveat emptor, or in English: Buyer beware.